I'm excited to share with you a project that's been on my mind for quite awhile. Back in February, I wrote a decorating dilemma I was experiencing. I had three excellent barstools--very sturdy, very comfortable--but very boring. After receiving lots of good advice, I decided that I should take the plunge and paint those babies. . . and I finally got it done. Let's pause for a moment to reflect upon the incredible transformative powers of paint. Makes your heart swell just to think about it, doesn't it? I spray-painted the stools with Rustoleum's Specialty Lacquer. 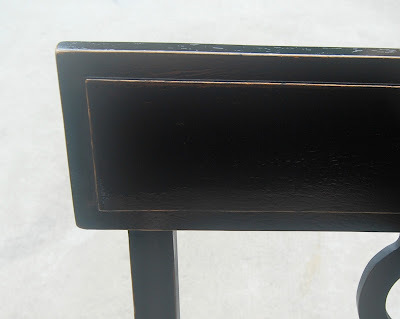 This stuff has strong fumes, so you must use it outside, but it provides a beautiful finish. Then I distressed the edges by sanding with coarse sandpaper. 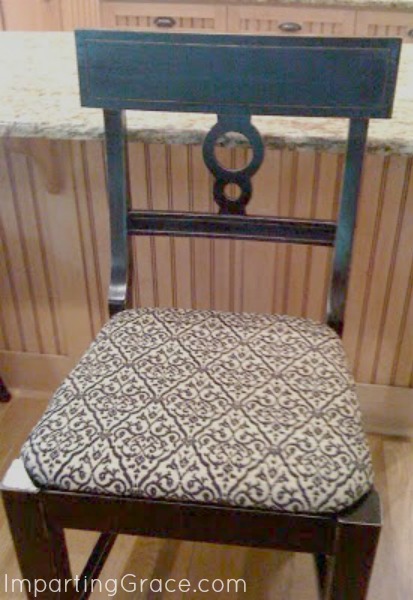 The seats I reupholstered with fabric I found at my local discount fabric store--$7.99/yard. Now I have three excellent barstools--very sturdy, very comfortable--and not at all boring! What do you think?? The Paint Challenge at The CSI Project. Wow! I'm in love with those chairs! Turned out great! Love it! They turned out so well! Great job! Oh I like them!! They look so much better! And I love your kitchen. Oh, they turned out beautifully! And also the perfect contrast to the wood in your kitchen. I love that fabric. i had wanted you to paint them each a different color. glad you didn't listen, hah! they look great black. i love the back of them with the hole in the middle. i didn't pick up on that detail before. Wow! That's impressive! I always love looking at pictures of your kitchen. I emailed you about something important. Did you get it? I am totally in love. They went from ho hum practical to magnificent!! Great job. You should link this to Woo Hoo! Wednesday this week. It's an awesome project. They looked as if someone waved a magic wand! You should have just let your boys "distress" them for you--boys are good at that :) Love your kitchen, especially that stove hood! Bravo. I think black (is it black?) is perfect. Now they pop and the sleek color bring out the circles. Richella, those look FABULOUS!!! I always love black and white anyway, but they are just gorgeous now! 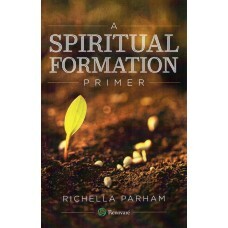 Yay, Richella!!! (jumping up and down and clapping hands) They look fabulous!!!! Perfect choices in colour and fabric - a FAB transformation! Great work!! I'm going to get myself some of that Rustoleum Specialty paint! Those turned out absolutely beautiful! Love, the color, the distressing, and the fabric. And no...they are NOT at all boring!!! They look wonderful! I love both the paint color and fabric that you used. The chairs turned out fantastic! Nice job. Everything looks lovely. Dropping by from BNOTP. Beautiful! I love the stools. I almost got those beadboard cabinets in my new kitchen in black. After seeing yours, I wish I would have. LOve the chairs, you did a fabulous job on them. Your chairs are gorgeous! What a transformation. Good job! They look fantastic! 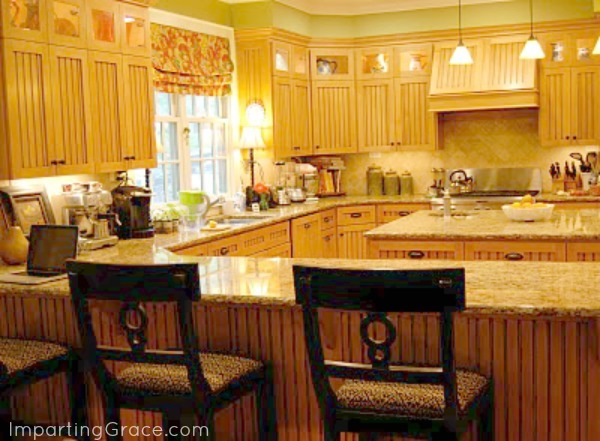 Love your fabric choice and they look great in your kitchen. 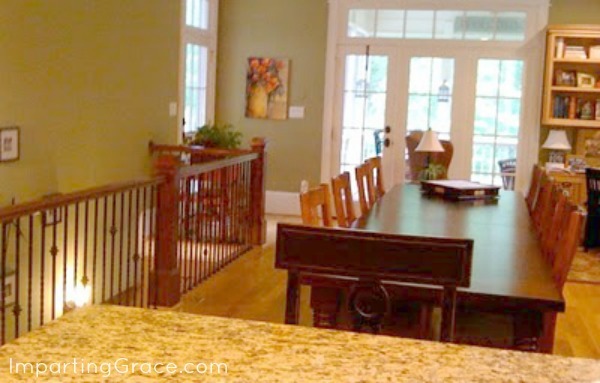 Fun to see your kitchen and dining room :). 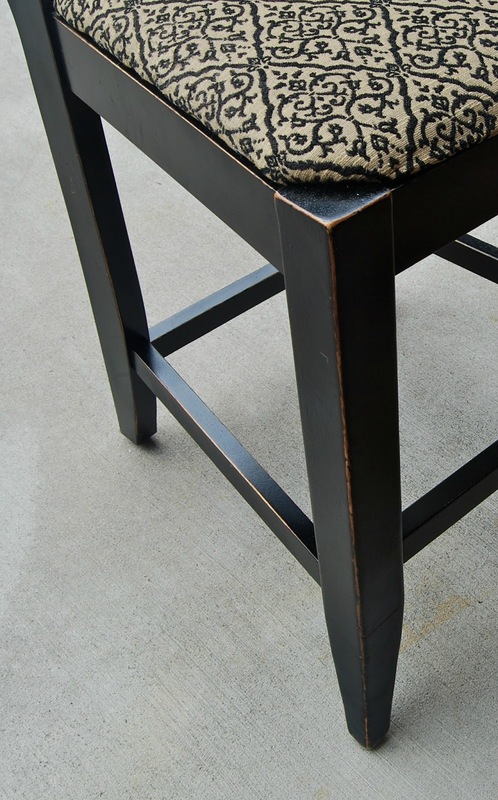 Your bar stools look wonderful! Your kitchen is to die for! They turned out great!! I really like the colors & fabric you chose. They are gorgeous! Love what you did, and glad I found your blog!! wow! you finished them! and they are beautiful. i love that fabric! I'm so glad you went ahead and did them! They look fantastic! They turned out great, good job! Wow! What a wonderful transformation! Definitely not boring anymore! They are beautiful! 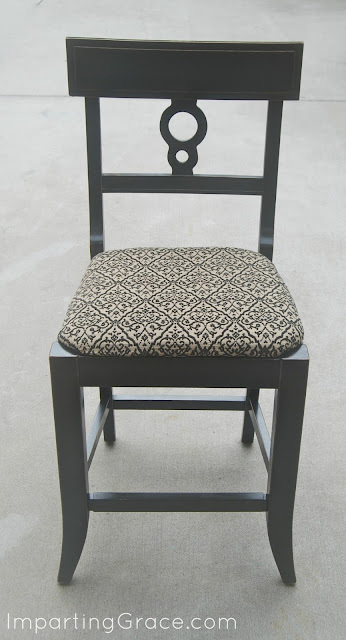 I adore the balck and the fabric is gorgeous! Well done! Thanks so much for joining the party at Woo Hoo! Wednesday. Your home is so beautiful and I'm so glad you enjoy sharing. Wow! That looks sooo good! You did a great job. Love the color and fabric you chose too. Just Beautiful! LOVE this... the fabric you chose is fabulous! Gotta love spray paint, right? Wow! Those chairs are so transformed they look like totally new ones! Good job! They really turned out well! Your chairs turned out beautifully! I love the detail of the woodwork on the back of the chairs! 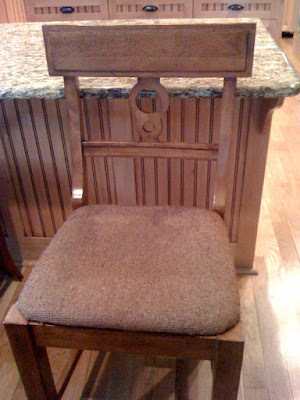 I just posted on my blog today a chair that I got at a yard sale on Saturday for $1.00. I hope my redo looks 1/2 as good as yours! You did a fabulous job! They look so different and they really stand out now. I love them in black! AMAZING!!!! Well done..I am about to take the plunge next week and start painting a few things too YIKES! 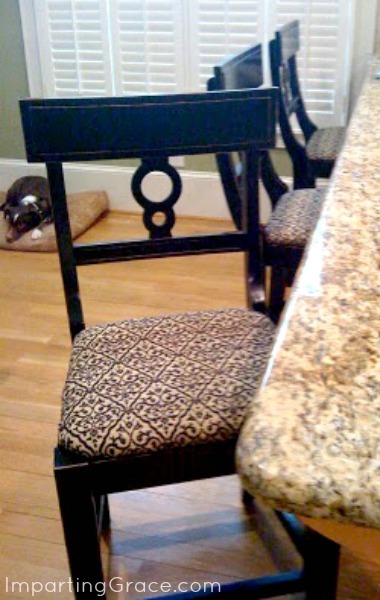 Hello sweet Richella - I love what you did with your bar stools! The transformation is fabulous. Love the color choice and that fabric is perfect. Thank you for sharing! These are beautiful!! love love love the fabric you chose too!!! I love the fabric that you chose! Your kitchen is amazing. Looks like something from a magazine! I am SWOONING over that kitchen! Gorgeous!! The chairs look pretty fab too. ;) Love ya girl! I love it! That black looks awesome! 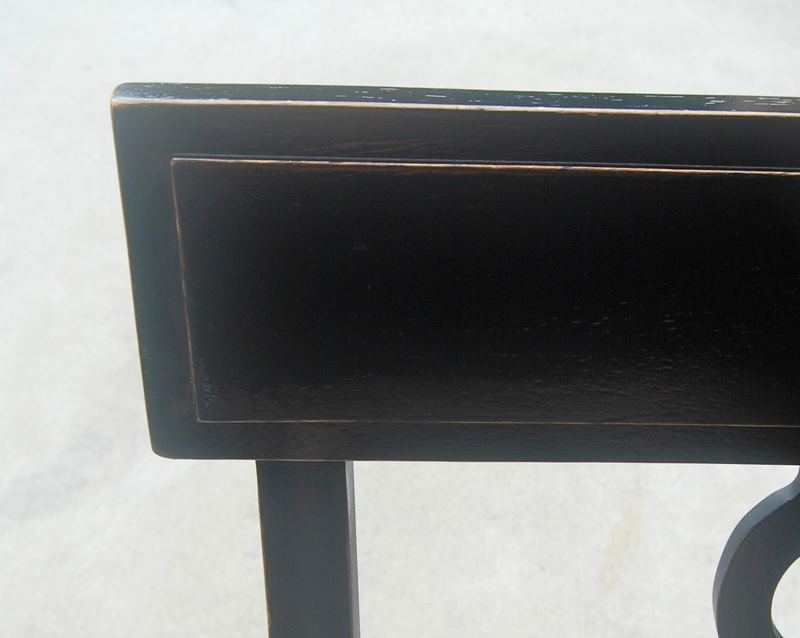 I recently painted my barstools black too. Such a classic color. Your kitchen is beautiful! Thanks for linking up to CSI!